Tomorrow marks the 60th anniversary of one of the most momentous U.S. Supreme Court decisions in the nation’s history, one so profound that it forever changed life in America. 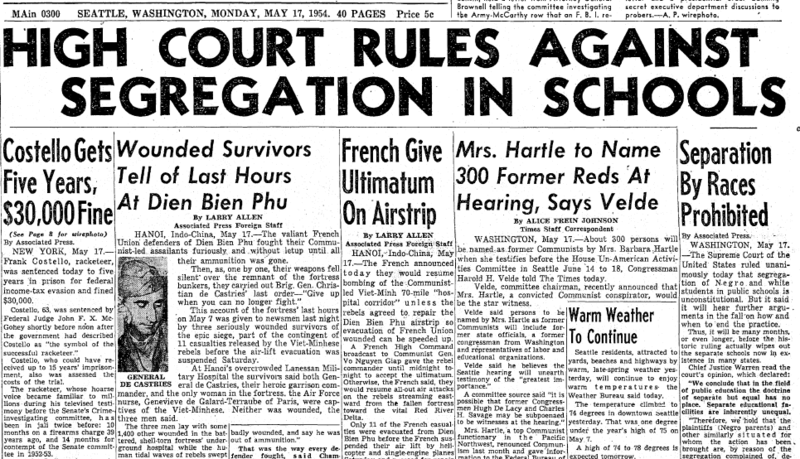 On 17 May 1954, the Court announced its Brown v. Board of Education of Topeka decision, ruling that segregation in public schools was unconstitutional. This unanimous Supreme Court ruling overturned the established “separate but equal” doctrine, opening up the path to integration and giving the Civil Rights Movement a solid legal foundation. On that May 17 day when Chief Justice Warren read the decision, the Supreme Court broke with its own tradition. Usually, reporters in the courtroom were handed printed copies of the decision just prior to its public reading. On that day, however, no printed copies were distributed, and it took a while before the Court’s decision was finally known. Everyone had to wait long, anxious moments while Warren’s reading began with an analysis of the history of the “separate but equal” doctrine, established by the Court’s Plessy v. Ferguson decision in 1896. It may have taken a while to finally learn the Supreme Court’s decision—but it did not take anyone long to realize the historic implications of the ruling. 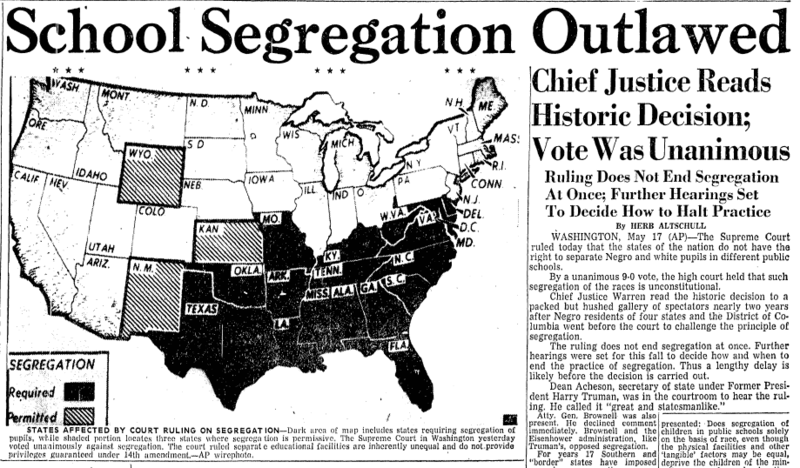 At that time, 17 states had laws requiring segregated public schools, and another 4 permitted it. All 21 of those public school systems would now have to be changed. Want to learn more? 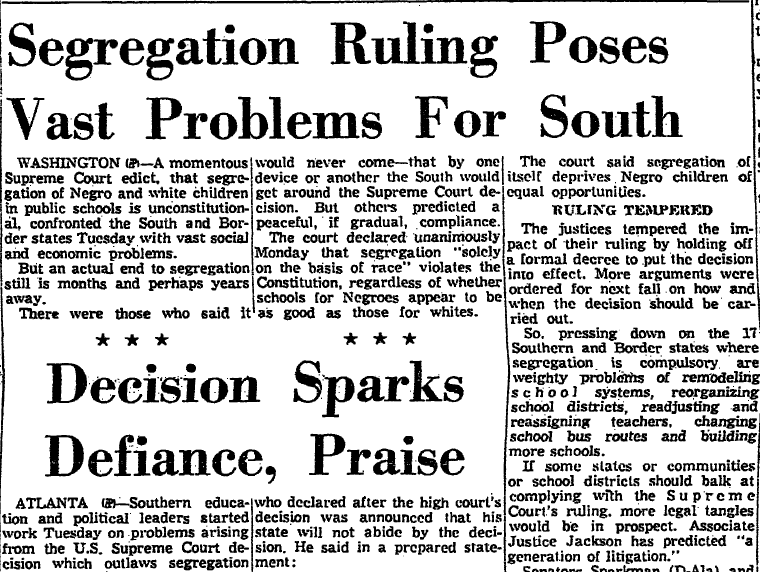 Explore over 2,000 news articles about the Brown v. Board of Education of Topeka Supreme Court case in our historical archives.